Rev. Maria E. Yocum-Carlson was called to become the first female pastor of Second Congregational Church at the beginning of the Advent season in 2006. She graduated from Catawba College in Salisbury, NC in 1993 with a Bachelor of Arts degree in Music performance (piano). She earned her Master of Divinity degree from Union Theological Seminary-Presbyterian School of Christian Education in Richmond, VA in 2000. 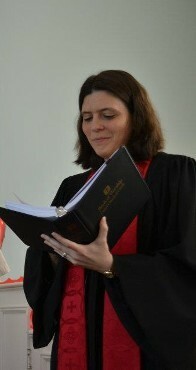 Pastor Maria was ordained in the United Church of Christ (UCC) in 2000, following in the footsteps of her father who was also an ordained UCC minister. She served Bethel UCC in Hickory, NC and did a brief interim ministry at the Unifour Christian Fellowship Church in Newton, NC before returning to school to further her education. She completed a Master of Sacred Theology degree at Yale Divinity School in 2005. In 2009, she married Josef Carlson, a fifth grade teacher at George H. Robertson Elementary School in Coventry. They reside in Tolland with their 3 cats. Pastor Maria and Joe like to travel and spend time with their famillies, especially their nieces and nephews. They also enjoy hiking and occassionally lead trail hike for church attenders and other interested persons. When Pastor Maria has free time she finds relaxation in reading, baking, needlework, watching movies and attending concerts and theatrical productions. You might even find her some days playing the piano or organ at the church, just to keep in practice!